In the summer months we often eat thin sliced breaded pork cutlets topped with a squeeze of fresh lemon for dinner. Served with a small salad it's a light, fresh meal that doesn't heat up the house. When I came across the recipe below, while browsing epicurious.com, I knew I had to give it a try. They say some dishes are better topped with an egg and I'll admit this is one of them. Using small sharp knife, cut all peel and white pith from lemon. Quarter lemon lengthwise, then thinly slice crosswise. Cover and chill lemon slices; discard peel. Mix sage, thyme, 1 teaspoon coarse salt, and 1 teaspoon ground pepper in small bowl. Sprinkle sage mixture over both sides of each pork cutlet. Place flour in shallow bowl and place eggs in another shallow bowl. Mix breadcrumbs and cheese in third shallow bowl. Working with 1 cutlet at a time, dredge in flour, shaking off excess, then dip in egg to coat. Place in breadcrumb mixture and coat both sides, pressing to adhere. Add enough oil to heavy large skillet to measure depth of 1/4 inch. Heat over medium-high heat. Working in batches, cook pork until browned and cooked through. Mix arugula with 2 tablespoons extra-virgin olive oil, chopped tomatoes and large pinch of coarse salt. Divide arugula among 6 plates. Place pork on top and sprinkle with chopped eggs, capers and lemon slices. I love pork and especially these thin cutlets, so thanks for the new inspiration! 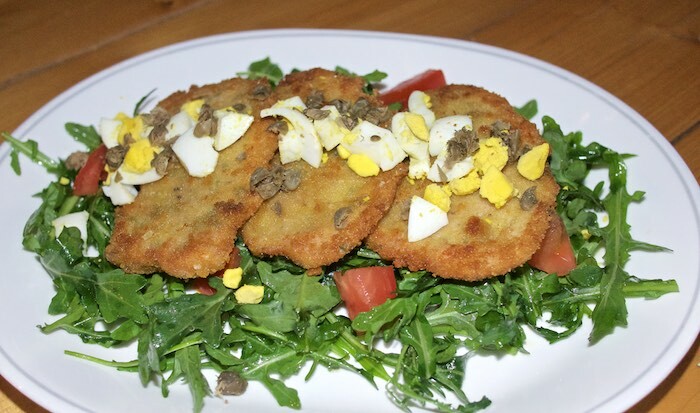 Loving the chopped egg, too, and, of course, everything's better with capers! I love pork cutlets. Great flavors in this recipe. These pork cutlets sound so good! The egg on top would be the perfect addition. Okay - this is my kind of dish. Love fried pork cutlets!